Lumbar puncture (LP) and bleeding risk visual summary. AF, atrial fibrillation; APTT, activated partial thromboplastin time; DOAC, direct oral anticoagulant; INR, international normalised ratio; PT, prothrombin time; TIA, transient ischaemic attack; VTE, venous thromboembolism. The potential benefits of an LP must be weighed against the risk of bleeding. Even a small volume haematoma can potentially cause significant morbidity, unlike small volume bleeding at other anatomical sites. In addition, although the risk of spinal haematoma is low, it has an associated a large morbidity; in the case series of 35 patients, 43% were left with significant disability, and 23% died within 12 months.13 If the procedure is deemed necessary but there remains a high risk of bleeding, repeat traumatic attempts should be avoided, and one could consider using fluoroscopic guidance to reduce the risk of accidental injury to small blood vessels.18 Spinal haematoma should be suspected in anyone post-LP who develops progressive motor or sensory disturbance, and/or sphincter disturbance; it is frequently painless, and most present several days after the procedure, with complete paralysis then developing over 10–15 hours.3 19 All suspected cases should be promptly investigated with MRI,20 as the more rapidly any necessary neurosurgical intervention occurs, the better the outcome.19 21 Complete neurological recovery is unlikely if neurosurgical intervention does not occur within 8 hours of symptom onset.3 Patients should be advised to seek emergency medical attention if they develop new neurological symptoms following LP. Suspending antithrombotics also carries risk; usually of cardiac or cerebral ischaemia, or of venous thromboembolism. Therefore, the potential benefits of performing an LP must be weighed against the risk of temporary suspension of antithrombotic treatment. High-risk patients should have appropriate bridging treatment, discussed in more detail below; however, this is still not without increased risk of thrombosis. If a patient has a complex medical background, or has started anticoagulant or antiplatelet treatment within the past 12 months, then the procedure, and any periprocedural potential changes in antithrombotic medication, should be postponed pending a discussion with the relevant specialty. Each patient should be considered on an individual basis, as there is likely to be several factors influencing the balance of risk and benefit. Guidance from the BSH suggests that a ‘safe’ platelet count for performing LP would be >40×109/L, and that those with a platelet count of 20–40×109/L be evaluated on an individual basis regarding the potential risk:benefit ratio.15 These recommendations do not take account of additional risk factors such as antithrombotics, other coagulopathies, platelet dysfunction or situations in which the platelet count may fall rapidly between blood measurement and procedure. If an LP is required in an emergency in a patient with thrombocytopenia, or if the platelet count is not expected to recover independently within an acceptable time period, then a platelet transfusion could be considered in selected patients; however, there is limited evidence to guide this,22 so discussion with the local haematology team is advised. Multiple guidelines concur that routine, unselected, coagulation testing is not required in those with a negative bleeding history and no liver disease.5 11 12 23 Coagulation tests can be considered for patients with a history of bleeding, anticoagulant drugs, liver or renal failure, disseminated intravascular coagulation, haematological disorders or inherited causes of coagulopathy.24 Note that coagulation test results do not correlate well with the risk of bleeding, and their utility is uncertain. We recommend discussion with a haematologist if the patient is considered at increased risk of bleeding for any reason, if there is a significant bleeding history, or if (should these tests are performed) an international normalised ratio (INR) or prothrombin time (PT) ratio is 1.5 or more, or the activated partial thromboplastin time (APTT) is prolonged above the reference range. Management of patients with known inherited bleeding disorders—including Von Willebrand disease, haemophilia, inherited factor deficiencies and inherited platelet function disorders—should be discussed with a haematologist for advice on specific management. Similarly, discussion is needed for patients with a personal or family history of unexplained bleeding who have not previously been investigated. Routine screening of coagulation and platelet count is not recommended in unselected patients. Coagulation tests can be considered for patients with a personal or family history of unexplained bleeding, currently on anticoagulant drugs, liver or renal failure, disseminated intravascular coagulation, haematological disorders or inherited causes of coagulopathy. The utility of these tests for predicting bleeding risk, however, is questionable, and a patient’s risk of haemorrhage should be considered on an individual basis. Any patient thought to be high risk for bleeding, or with a platelet count of <40×109/L, or a PT or APTT above the normal range, should have their treatment options discussed with the local haematology service, and be considered for postponing or avoiding the LP. If an LP is required urgently, then one could consider giving intravenous vitamin K 5 mg to reverse the effects of warfarin, administered no <6–8 hours before the procedure. If more urgent reversal of warfarin is required then prothrombin complex concentrate should be used in addition to the vitamin K. Discussion with the local haematology service is advised before urgent reversal of warfarin.9 23 26 Following a procedure, the ACCP advise restarting warfarin 12–24 hours after surgery, whereas the ESA advise that it can be restarted after catheter removal with neuraxial anaesthesia.4 9 The ACCP recommend prescribing double the patient’s usual maintenance dose for the first 2 days when restarting, and this has been shown to be safe and effective,9 27 although many start the patient’s usual dose. Recommendations on adjustment of treatment regimens of the direct oral anticoagulants (DOACs) vary significantly between different advisory bodies; online Supplementary file 2 summarises the figures.3 5 7 30 34–37 They are all partially renally excreted; therefore, the length of time for which they need to be withheld before procedures depends on patients’ renal function. Standard coagulation tests such as the APTT and PT are not effective for monitoring DOACs. If an estimate of the anticoagulant effect of a DOAC is required before an LP, then drug-specific concentrations can be measured, but routine testing of these before procedures is not necessary. Additionally, for dabigatran, a normal thrombin time and APTT indicate there is very little anticoagulant effect.38 Idarucizumab is a specific antibody-reversing agent for dabigatran, and can be used for emergency reversal of dabigatran. Andexanet-alfa is a reversal agent for rivaroxaban, apixaban and edoxaban, which is in clinical trials and not available outside clinical trials in the UK at the time of writing.39 If urgent reversal of a DOAC is required, we recommend consultation with a haematologist. Following intravenous thrombolysis, there is significant derangement in haemostasis for longer than 24 hours, and the need for an LP should be carefully considered.6 19 In this situation it may help to measure the fibrinogen concentration, as this is one of the last clotting factors to recover following thrombolysis.3 6 19 Thrombolysis is not recommended in the 10 days following puncture of non-compressible vessels.6 If thrombolysis were required in the 10 days following an LP then the risks and benefits would have to be considered on an individual basis. There is little or no evidence to enable any useful recommendations following administration of local (eg, intra-arterial or intravenous sinus) thrombolysis but there is unlikely to be any significant derangement of systemic haemostasis beyond 24 hours. Warfarin should be withheld for 5 days before an LP, and the INR, checked on the day of procedure, should be ≤1.4; warfarin can be restarted from 12 hours following the procedure. Patients at high risk for thrombosis should have bridging treatment dose LMWH, these include: patients with a venous thromboembolism within the previous 3 months, or previous venous thromboembolism while on therapeutic anticoagulation, those with mechanical heart valves other than those with a bileaflet aortic valve and no other risk factors, those with atrial fibrillation and previous stroke or transient ischaemic attack in the past 3 months or previous stroke/transient ischaemic attack and CHA2 DS2-VASc score of ≥3. Patients with venous thromboembolism >3 months earlier should receive prophylactic dose LMWH bridging. Ideally, bridging LMWH should be started once the patient’s INR falls below target range, which will be around 36 hours after the last dose of warfarin. Treatment dose LMWH should be withheld for 24 hours, and prophylactic dose for 12 hours before the procedure. Both can be restarted 4 hours after LP if atraumatic; consider postponing treatment dose LMWH for 24 hours if the procedure was traumatic. Prophylactic dose fondaparinux should be withheld for at least 36 hours before, and 6–12 hours after LP. LP should be avoided if possible in patients on treatment dose fondaparinux as there is little evidence around the bleeding risk, and concerns about accumulation. Intravenous unfractionated heparin should be withheld for 4–6 hours before LP, and restarted 1 hour after LP. In patients with normal renal function (creatinine clearance ≥50 mL/min), rivaroxaban and apixaban should be withheld for at least 24 hours before the procedure; dabigatran for at least 48 hours. The DOACs can be restarted 6 hours after LP. In emergency situations, warfarin and some DOACs can be reversed; this should be discussed with the local haematology team. Aspirin has not been shown to increase the risk of serious bleeding following minor procedures such as LP and so can be continued safely.2–4 19 A randomised controlled trial looking at the use of low-dose aspirin for pre-eclampsia found no significant difference between the number of adverse events following epidural anaesthesia reported in those taking aspirin; haemorrhage occurred only in 1 of 1422 patients taking aspirin (53% continued to within 1 day of procedure), and 2 of the 1361 allocated to placebo.40 Since then there have been further studies, including 193 orthopaedic patients undergoing spinal or epidural anaesthesia,40 and 383 patients taking aspirin (158) or non-steroidal anti-inflammatories (NSAIDs), undergoing epidural corticosteroid injections; these showed no increase in minor (‘bloody tap’) or major haemorrhagic complications compared with patients not on aspirin or NSAIDs.17 High-dose aspirin is likely to produce a higher risk of bleeding, but there is little guidance with respect to time intervals for which this should be withheld. The ESA suggest that clopidogrel can be restarted immediately after catheter removal, and prasugrel and ticagrelor after 6 hours, in neuraxial anaesthesia, whereas the ASRA suggest withholding for a further 24 hours.3 4 One could argue that 24 hours may be too long a window, unnecessarily increasing the thrombosis risk, whereas restarting immediately would pose difficulties if a spinal haematoma were to present in the first few hours following the procedure; in the absence of more concrete evidence, we recommend restarting these after 6 hours. There is no universally available reliable test to measure platelet function, and there is no proven effective reversal treatment in emergency situations. There is in vitro evidence that transfusion of two to three adult doses of platelets may reverse the effects of antiplatelet drugs,46 47 and limited evidence from a single arm clinical trial for patients taking dual antiplatelet therapy before major non-cardiac surgery.48 A randomised trial comparing platelet transfusion with no platelet transfusion for reversal of antiplatelet drugs in intracerebral haemorrhage reported no improvement in haemostasis and an increase in the combined end point of mortality and disability.49 Consequently, there is uncertainty about the efficacy of this approach before elective procedures. 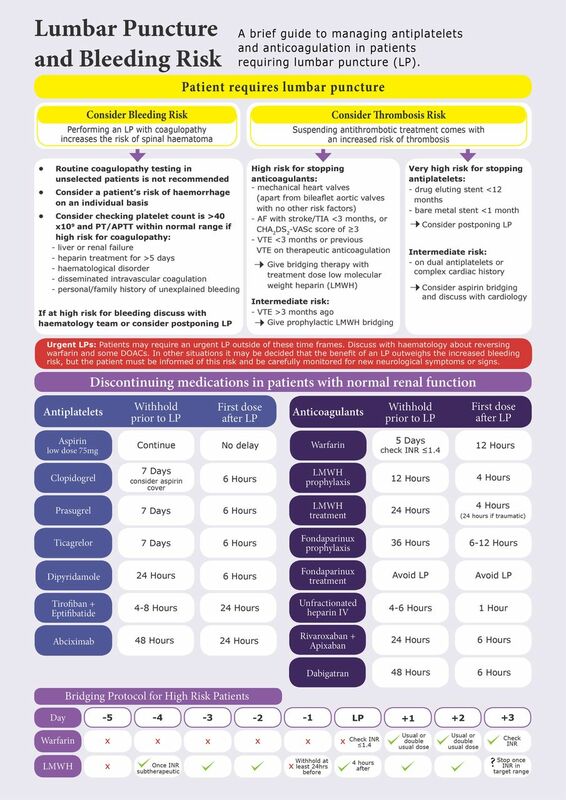 There is limited evidence in the setting or cardiac surgery that desmopressin might reduce the risk of bleeding for patients taking antiplatelet drugs.50 However, there is insufficient information to balance the risks and benefits of desmopressin for LP and on current evidence it cannot be recommended. Accordingly, reversal of antiplatelet drugs should not be considered as a matter of routine, but for high-risk procedures we recommend discussion with a haematologist about options for antiplatelet drug reversal. If an anticoagulant or antiplatelet effect persists, haemostasis may be improved by the use of preoperative parenteral tranexamic acid, which has been shown to reduce blood loss and transfusion requirements in both cardiac and trauma surgery, without increasing thrombotic complications. Low-dose aspirin (75 mg once daily) does not need to be withheld prior to LP. Patients at very high risk for thrombosis if antiplatelets are stopped include those with drug-eluting coronary artery stents placed within the previous 12 months, and bare metal coronary stents placed within the previous 1 month. In these patients, LP should be avoided or delayed, where possible, to avoid withholding the antiplatelets in these high-risk periods. If the benefit of LP is felt to outweigh the risk of stopping antiplatelets, discuss with the relevant cardiology team. Patients at intermediate risk, for example, those on dual antiplatelets who do not fall in the very high risk category above, or those with a complex cardiac history, should have their aspirin continued while their other antiplatelet is withheld, or consider aspirin bridging therapy in those not on it already. Clopidogrel, ticagrelor and prasugrel should be withheld for 7 days before LP, and can be restarted 6 hours after procedure. For emergency reversal of antiplatelet drugs, we recommend discussion with a haematologist about the risks and benefits of using platelet transfusion (2–3 units). Current evidence and guidance on periprocedural management of antithrombotics in patients undergoing spinal procedures is primarily for neuraxial anaesthesia rather than LP. Some of the issues that need to be considered when comparing the risk:benefit ratio are complex, and have not been fully researched. Clinicians should be aware of these complexities, be vigilant for both bleeding and thrombotic complications when performing LP, and act quickly if spinal haematoma is suspected. Guidance is variable, with American guidelines tending to be more cautious about bleeding risk than European guidelines. It is important to remember that withholding antithrombotics for longer than required confers an increased risk of thrombosis that may be unjustified. Patients should always be considered on an individual basis and those thought to be at high risk for either bleeding or thrombosis should be discussed with the relevant local teams in haematology or cardiology, with careful consideration as to whether the LP is truly indicated. In some cases, LPs are required urgently: for example, in suspected subarachnoid haemorrhage, bacterial meningitis or viral encephalitis. In these cases, where a patient is on antithrombotic drugs that have not been stopped for the recommended period, the clinician must make a decision as to whether other diagnostic investigations would provide similar reliability. It may be felt that an LP is an urgent and necessary test; in these cases, again a discussion with haematology or cardiology teams may be helpful to safely reverse warfarin or some DOACs, or treat thrombocytopenia, as described above. There is limited evidence for periprocedural management of patients on irreversible agents such as clopidogrel, and with an unknown but likely rare risk of epidural haematoma; thus, a clinician may choose to proceed with an emergency LP, with consent from the patient, a careful approach to avoid traumatic tap and subsequent careful clinical observation. There is still a lack of clarity on newer antithrombotics around the safe time periods to withhold before, and restart following, a spinal procedure. Due to the rarity of bleeding complications in LP, it will be impossible to provide definitive advice but updates to this guideline will be required as further evidence is acquired. Further agents are likely to appear over the coming years and the appropriate periprocedural management of these will also need to be established. It would also be beneficial to gain better data on the incidence of spinal haematoma following LPs specifically, in order to aid neurologists to make more informed decisions when weighing up bleeding risk. A patient’s bleeding risk should be considered on an individual basis, based on personal and family history, comorbidities and medications. Patients with a high bleeding risk have an increased risk of spinal haematoma following lumbar puncture (LP). Routine screening of coagulation is not recommended on unselected patients, but those thought to be at high risk of bleeding should be discussed with the haematology team before the procedure. Low-dose aspirin (75 mg once daily) can be continued safely when performing LPs. Other antithrombotics should be withheld for appropriate periods before and after an LP to reduce the bleeding risk. Where an LP cannot be delayed, it is possible to reverse warfarin and some direct oral anticoagulants with an available antidote. If the agent is irreversible, such as clopidogrel, then an urgent LP must be considered carefully, as there is no evidence on the best management. When deciding to stop an antithrombotic medication to perform an LP, one must consider the increased risk of thrombosis that this confers. In patients at very high risk of thrombosis, the LP should be delayed or avoided, where possible. Patients at high risk of thrombosis in whom an LP is necessary should be given appropriate bridging treatment. The authors would like to thank Dr Nicola Curry, and Professor Michael Laffan, Dr Keith Gomez and Dr Will Lester from the British Society of Haematology Haemostasis and Thrombosis Task Force, and Dr Gareth Llewelyn, the Chair of the ABN Acute Neurology Advisory Group, who reviewed the article and provided recommendations, as well as Sarah Hill, who provided graphic design support of the visual summary. Association of Anaesthetists of Great Britain and Ireland, Obstetric Anaesthetists’ Association and Regional Anaesthesia UK. Regional anaesthesia and patients with abnormalities of coagulation. Anaesthesia 2013;68:966–72.
. Recommendations for anticoagulated patients undergoing image-guided spinal procedures. AJNR Am J Neuroradiol 2006;27:468–70.
. British Committee for Standards in Haematology. Guidelines on oral anticoagulation with warfarin - fourth edition. Br J Haematol 2011;154:311–24.
. Severe neurological complications after central neuraxial blockades in Sweden 1990–1999. The Journal of the American Society of Anesthesiologists 2004;101:950–9.
. Regional anaesthesia and thromboembolism prophylaxis/anticoagulation revised guidelines of the German Society of Anaesthesiology and Intensive Care Medicine. Anasthesiologie & Intensivmedizin 2003;44:218–30.
. CLASP: a randomised trial of low-dose aspirin for the prevention and treatment of pre-eclampsia among 9364 pregnant women. The Lancet 1994;343:619.
. British National formulary. London: BMJ Group and Pharmaceutical Press, 2017. Provenance and peer review Commissioned. Externally peer reviewed by Brendan Mclean, Truro, UK, and by Christopher Kipps (Chair) with other members of the Quality and Guidelines Committee of the Association of British Neurologists, London, UK.